Twisted Cork is the name of the bar in 0/8 Seafood Grill. They have a large selection of wines by the glass or flight; an interesting list of specialty cocktails; Happy Hour from 3:00pm – 6:00pm daily; and a weekly wine tasting event that includes food pairings called, Sauce. 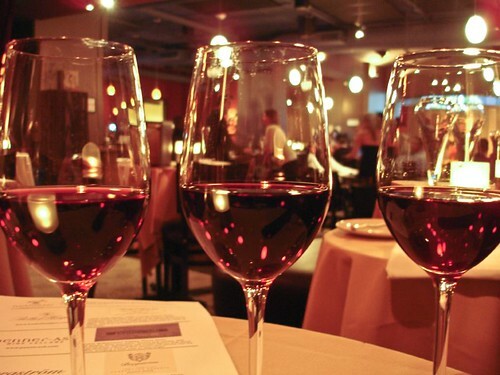 The tasting and pairings are available every Wednesday from 5:00pm – 7:00pm. I love the Happy Hour and the flights of wines but had yet to check out Sauce. A friend and I finally made a plan and arranged to meet at the bar last Wednesday. We didn’t know what the night’s tasting would be (sometimes it’s announced in the restaurant newsletter but not always) but thought we’d take our chances. We were delighted to hear that the night’s wines would all be Oregon Pinot Noir. The three served that night were all 2006 vintages and included: Bethel Heights Eola-Amity Hills Cuvée Pinot Noir; penner-ash Willamette Valley Pinot Noir (92 points, Wine Spectator); and Bergström Cumberland Reserve Pinot Noir (91 points, Wine Spectator). The flight of wines was brought to the table and soon after our food pairings arrived. I was too busy sipping to take perfect notes on the food when it arrived but the three items included: beef in a plum and ginger sauce; prosciutto with manchego; and a crab risotto. We had a great time sipping wines on their own, matching them with the different bites and changing our minds about our favorites as we went along. The 0/8 menu had just changed that day so we also sampled a bowl of the new lobster risotto and my friend ended her evening with a peach tart topped with luscious ice-cream! This was really a great way to try some high end wines without breaking the bank. I hope to stop in again soon. And next time I’ll be better prepared to take notes on the food….